After a three-year campaign, residents in College Place finally have the keys to a secure bike storage unit, the first of its kind to be installed in the borough. The Bikehangar structure, which provides secure, weather-proof parking for six bicycles in an area the size of one car parking space, was erected in August following a long campaign, begun by resident Ursula Gotel in 2011 when Camden Council threatened to dispose of her bike if she continued to leave it in her shared hallway. There is nowhere to secure bikes along College Place, a residential street in Camden, where only the ground floor flats have outdoor space. The street is one block west of Royal College Street, which recently underwent a major overhaul to provide cycle lanes in both directions for London’s growing number of cyclists. “I am delighted that after three years of patient campaigning, the residents of College Place at last have a pair of Bikehangars. 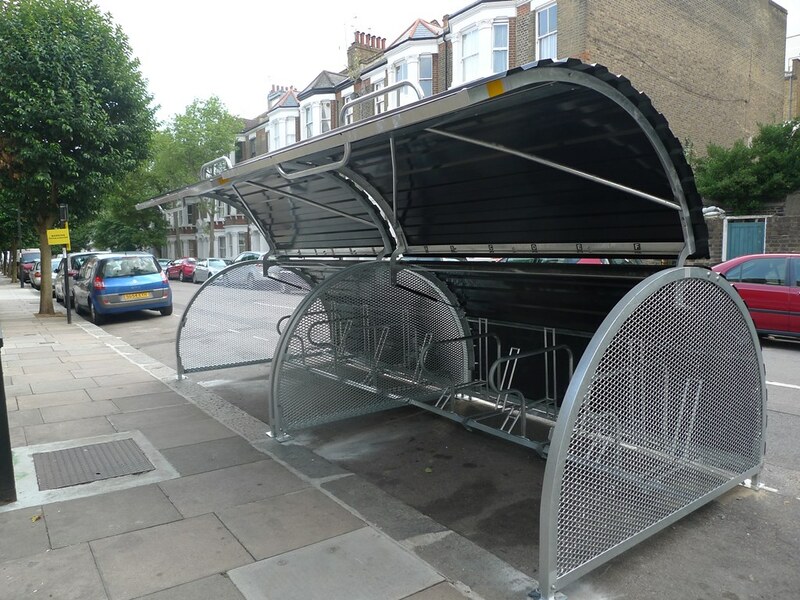 I trust that they will provide positive feedback to the council regarding their experience with the Bikehangars to encourage Camden to install more wherever they are needed in the borough. Camden Council must be aware that if they want to encourage a wider take up of cycling it is essential to provide anyone that wants to cycle with safe and convenient cycle storage.” — Jean Dollimore, Camden Cycling Campaign. Gotel began work on securing the bike storage by canvassing local views and asking College Place residents to sign a petition, as well as handing out a questionnaire which showed a positive response overall. The converted Victorian flats in College Place are small and the hallways and stairwells narrow. There is no convenient space, indoors or outdoors, for residents to keep their bikes. Many residents are families who say they would like their children to cycle. The two units, which can hold up to 12 bicycles, are known as Bikehangars and run by Cyclehoop. There are close to 300 Bikehangars across the capital, and sites include the boroughs of Lambeth, Lewisham, Hackney and Haringey, with Southwark and Wandsworth also due for this type of storage by the end of the year. Cost depends on how each unit is managed, but this pilot scheme is £30 (per bike) per year. Cycling is an economical and very efficient way to travel around the capital as well as being environmentally-sound. It is also good for our health. Rearing a city of young cyclists will bring many benefits to London and its residents. “I feel brilliant now that the unit is here and can’t wait to start using it,” says Gotel. “I hope that people who were opposed to it will see it, and would be ok with some more! “We need these on every street, and an allowance for at least one space per household. Ideally I’d like to see two or three per household and secure storage for family bikes as well as visitor stands.